TROUTMAN- Our sweet baby girl, Clara Faith Menster, went home to be with Jesus on July 7, 2017. 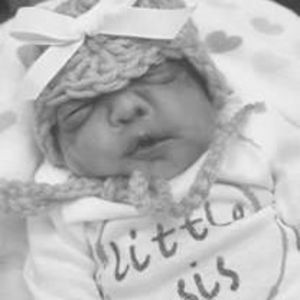 Born on July 7, 2017 she was the infant daughter to Jacob and Alicia Menster who were honored to have been chosen to be her loving parents. We will always remember and cherish the short time she was here with us and rejoice in the knowledge that she awaits us in Heaven with our Lord. In addition to her loving parents she leaves behind a big brother, Davis; big sister, Parker; cherished cousin, Paisley Newton; grandparents, Mimi & Papaw (Janet & Keith Menster), Mimi (Trena Melvin), Papaw (Wayne Melvin); great-grandparents, Mamaw & Poppy (Ruby & Lloyd Davis), Mamaw (Christine Menster), Gram (Barbara D. Melvin); aunt, Jennifer Menster; uncle, Justin Melvin and many other loving extended family members. A graveside service with family and close friends will be held on Thursday, July 13, 2017 at 10 am at St. Michaels Cemetery. The family will be gathering and welcoming friends in the fellowship hall of Mountain Road Baptist Church on Thursday from 11am-1pm after the graveside service. Her parents would like to extend their gratitude to their parents, friends and family who have prayed and supported them through this journey. To Mountain Road Baptist Church and to our adult Sunday school class for their love and support. A heartfelt thank you to our midwife, Lynn Chiappelli, CNM, her wonderful staff at Novant Health Nurse Midwifery Associates-Langtree for walking this journey with us and celebrating Clara's life. Also, the loving nurses at Novant Health Huntersville Medical Center Labor and Delivery Unit especially, Stacy, Andrea and Elizabeth, for their excellent care and the honoring of Clara in her birth and death. Thank you to Tracy, Judy and Roxi from Be Not Afraid (Prenatal Hospice) for your love and guidance following Clara's diagnosis. Thank you to Faith with Now I Lay Me Down to Sleep for capturing precious pictures of our baby girl. The lasting memories forged with the help of Mary Clark Hauser and Lindsey Henkel would not have been possible without the support and generosity of these two amazing ladies and we will forever be thankful for your everlasting friendship. For friends and family that would like to donate, we ask that in lieu of flowers your make donation to Be Not Afraid, 8800 Glenside Street Huntersville, NC 28078, in her memory, to an organization that helps other parents who are called to walk to the same path we have walked with our sweet Clara or Rainbow Kidz of Iredell County Hospice 2347 Simonton Road Statesville, NC 28625. Thank you to Bunch-Johnson Funeral Home for their professionalism and personal attention.